Posts on this site may contain affiliate links. Read the full disclosure here. 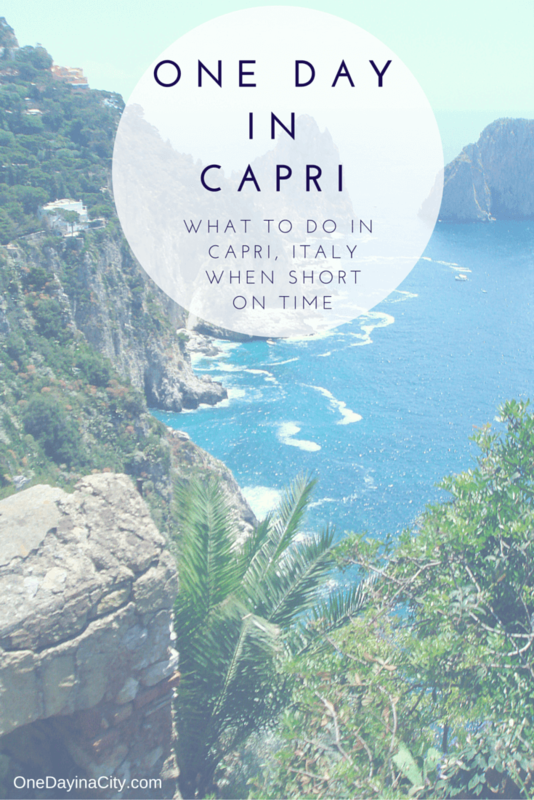 You don’t have to be a jet setting millionaire to fall head over heels in love with Capri. 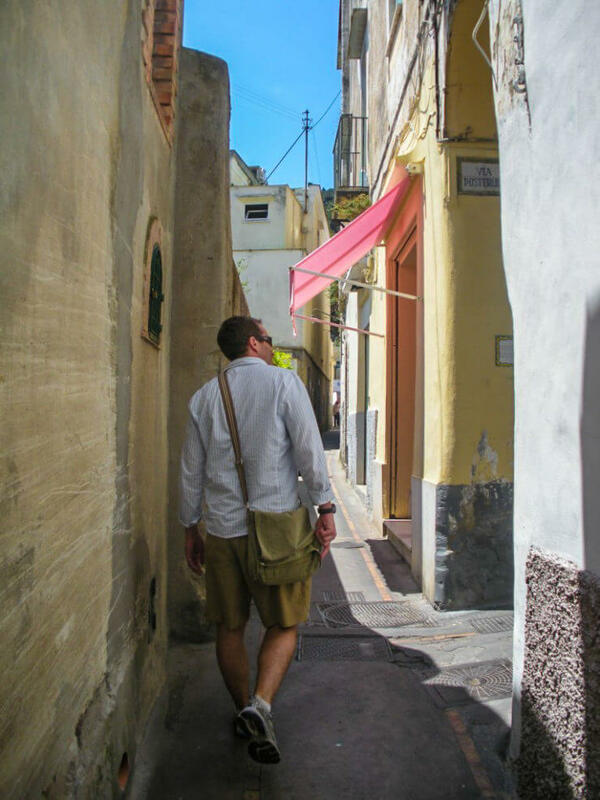 The island, a short ferry away from Naples and the beautiful Amalfi Coast in Italy, is perfect for visiting for just a day. Day tripping there for your one day in Capri will also save you money as most accommodations on the island are expensive, though if you choose to stay overnight there are some marvelous options for a memorable night in Capri. 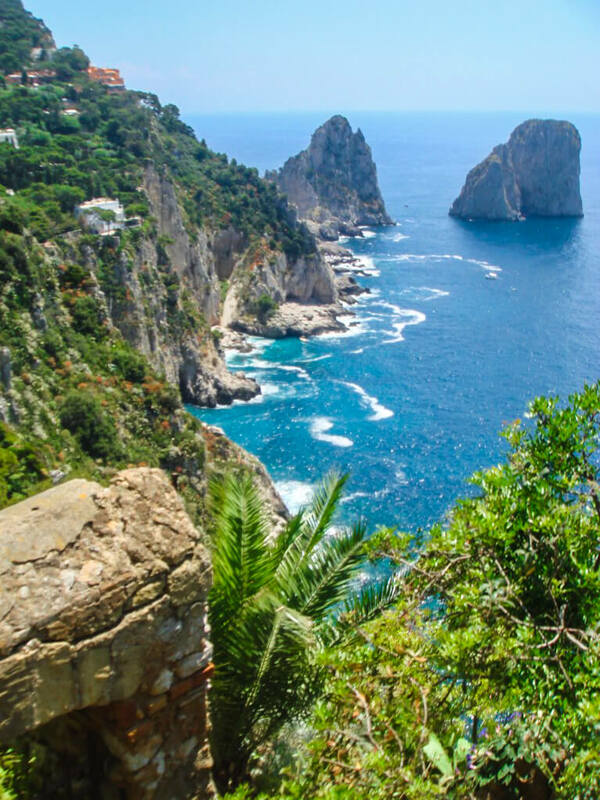 Capri lushly juts out of the ocean in an abundance of rock and greenery and is ensconced in a perimeter of tall cliffs and winding trails and roads. Gorgeous, multi-million dollar homes perch smugly on hilltops and even the harbor has an air of relaxation and luxury. This article contains affiliate links, which cost nothing to you, but helps me cover the cost of running this site so I can continue to bring you helpful travel content! Most people (meaning those of us without private jets and helicopters) arrive for our one day in Capri via Marina Grande, Capri’s main harbor. From Marina Grande, there is easy access to the rest of the island. I recommend starting out with a boat ride to the Blue Grotto, Capri’s most famous landmark. Doing it first will help ensure you don’t run out of time to see it – this is one adventure not to be missed. 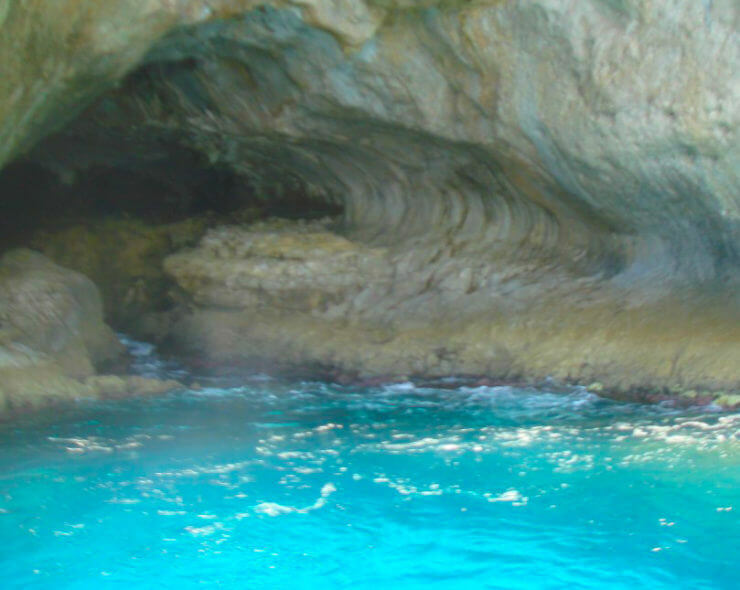 The Blue Grotto is a cave embedded in the side of Capri that is accessible via canoe through a small tunnel that leads you to an open area of wonderment. The small level of light that is able to enter the cave hits off of the turquoise colors of the water and gives the cave a blue glowing hue that is incredible. Sadly, I only know this from friends, pictures, and TV travel shows since the day I was in Capri, there were rough waves, resulting in the Blue Grotto being inaccessible. Which they did not tell me when I purchased tickets for the boat ride around the island that included a stop at the Blue Grotto. Instead, they pulled up right outside the entrance to the cave and the driver informed us over the intercom that the Blue Grotto was closed for the day due to unsafe water conditions. To say there were some disappointed faces on the boat would be an understatement. I‘m sure my look was one of the worst. I was absolutely crestfallen – at least it gives me an excuse to go back to Capri. But I did still get to see water this magnificently blue while in Capri. No knowing the Blue Grotto was closed turned out to be a good thing because I probably wouldn’t have taken a boat ride around the island during my day in Capri if it hadn’t included a stop at the Blue Grotto; I’m glad I did because the tour of the island via water ended up being a highlight of the day. So in the end I didn’t hold it against the ticket seller too much that when I asked him to confirm the boat ride did for sure include a stop at the Blue Grotto with time to canoe into it, he said yes and omitted (I’m assuming on purpose) the fact that the Blue Grotto was closed for the day. 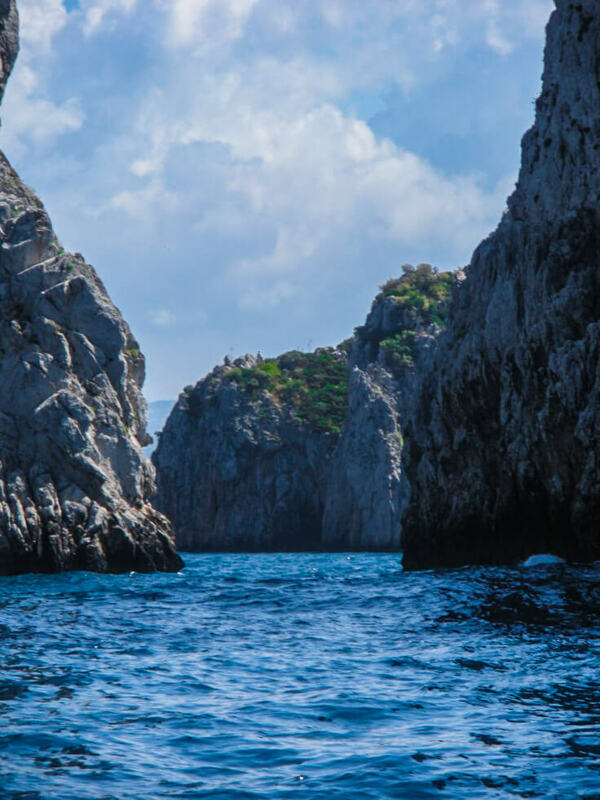 The boat ride took us through rock formations and into little hollows in the cliff that, while probably not of Blue Grotto standards of blue, did allow us to peer over the edge at water rippling in deep, vibrant shades of teal and turquoise. The water of Capri is nearly as enchanting and inviting as the island itself. To really explore the island of Capri, you must delve deep into it. After the boat ride drops you back at Marina Grande, the funicular offers a fast and affordable transport up the cliff to Capri Town, a winding maze of streets through some incredible real estate and hotels I only wished I could afford to stay in. 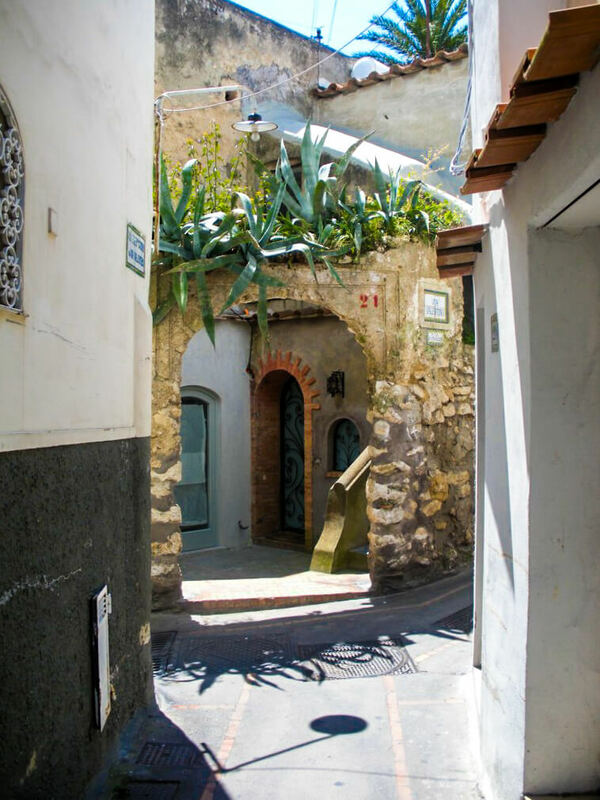 Getting lost in the alleys of Capri Town. 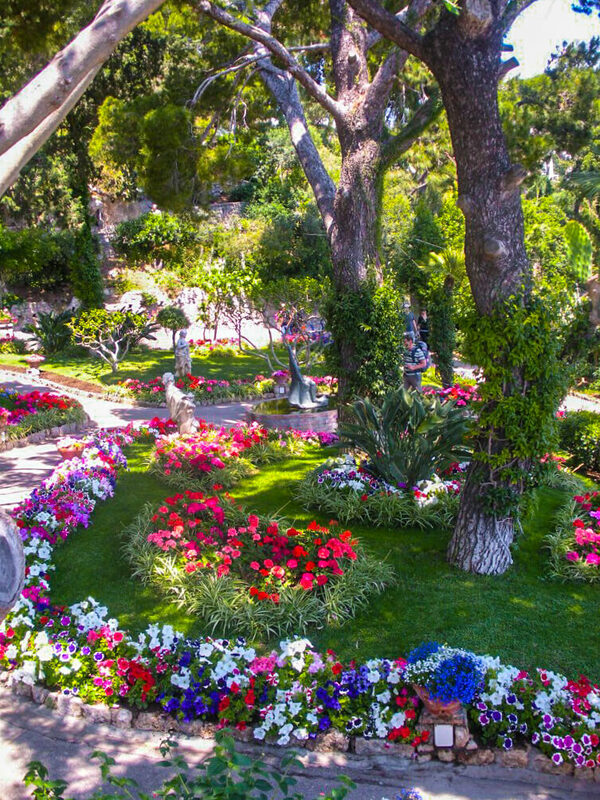 At one end of Capri Town are the beautiful Giardini di Augustus (Gardens of Augustus), which are peaceful to walk around in and have incredible views of the island and sea. Capri Town eventually turns into a bit of a Rodeo Drive atmosphere. Prada, Gucci, Louis Vuitton, etc. are all beaming out from otherwise unassuming buildings line the main walking path of Capri Town. Unless a designer handbag is on your vacation to do list, I wouldn’t dawdle in designer-ville long if you only one day in Capri. There is too much rugged and coastal landscape to explore on the island. Sunglasses — I like polarized ones for traveling. Swimsuit in case you decide to jump in that gorgeous water. Don’t forget a cover-up, too! Comfortable shoes — You’ll be doing a lot of walking. You also may want to throw some water shoes into your daypack since the beaches are rocky. And this is a must if in Capri in summer. 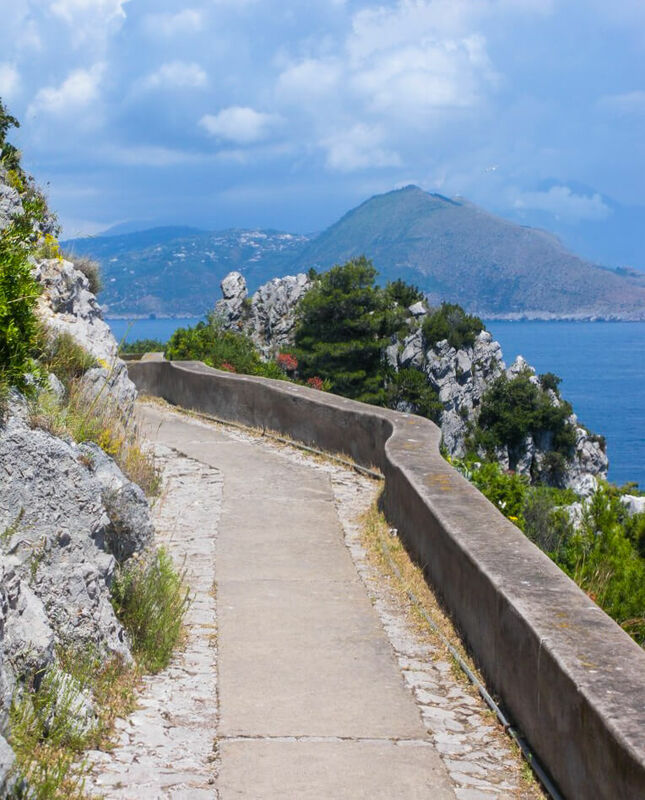 Capri has several trails perfect for hikes. The tourist center in Marina Grande can provide you with maps listing time estimates. Pick one that gives you plenty of time to catch the funicular back down the hill – there can be quite a line at the end of the day and you don’t want to miss your ferry back to the mainland. Some of the trails are also more strenuous than others. The hike I did was the one to Arco Naturale (Natural Arch), and it ended with hundreds of steps up the side of the cliff. The views sure were worth it, but my thighs were definitely complaining. Also, the end of the trail emptied into a road leading past quaint little farms and vineyards, vastly different from Capri Town only a moderately short walk away. If you have extra time to spend on the island, the town of Anacapri is a short bus ride away from Capri Town and is much more tranquil and unassuming part of the island. 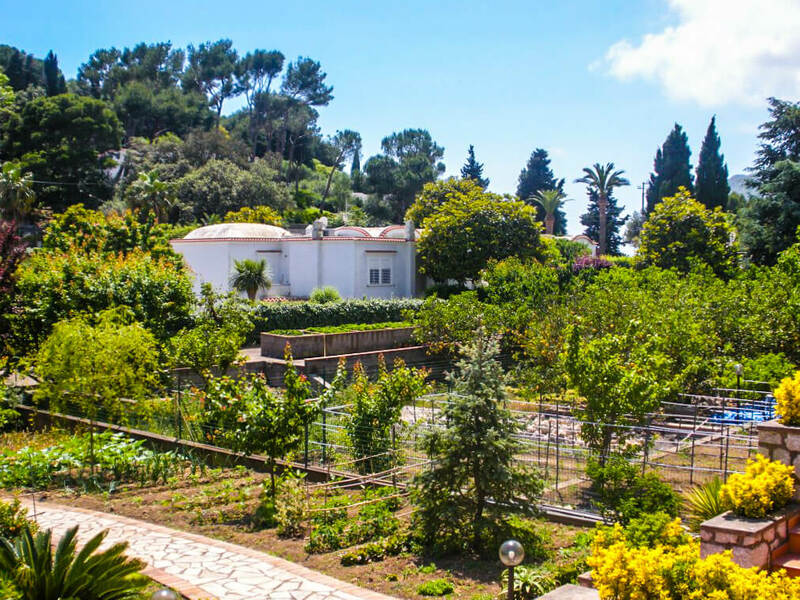 Sights include the famous Villa San Michelle and a chairlift that will take you to Mt Solaro, the highest point in Capri. Planning to spend the night in Capri? Here are two good options, one that’s a luxury option and the other a better fit for budget travelers. Luxury Option: Hotel Excelsior Parco, which is a luxury boutique hotel with fabulous views in an Italian Art Nouveau mansion. There are only 11 rooms, some of which have private terraces and hot tubs. Hotel Excelsior Parco also an onsite restaurant and bar, and a concierge to help you with your travel needs. Click here to see pictures and rates for Hotel Excelsior Parco. Budget Option: It’s hard to find many budget hotel options in Capri, but Hotel Weber Ambassador offers a good rate, while not sacrificing the chic Capri vibe or those fantastic views. Click here to see pictures and rates for Hotel Weber Ambassador. Or search for Capri hotels using one of my favorite accommodation booking sites for Europe, Booking.com. It’s easy to use, has the lowest pricing, free cancellation for most hotels, and you can often book now and not pay until you arrive. Even without seeing the Blue Grotto, Capri with its dense vegetation, winding lanes, pretty farmland, and exquisite waters is easily one of the most beautiful places I’ve ever been. Get More Travel Tips & New Articles on Facebook! Simply Click “Like” Below. People Watching in Capri…and Armani?